Orthodontics is devoted to building beautiful smiles by bringing teeth, lips, and jaws into proper relationship. Straight teeth function better, are easier to clean, and are likely to last a lifetime. When left untreated, many orthodontic problems become worse. Orthodontic treatments to correct the original problem is often less costly than the additional dental care required to treat more serious problems that can develop in later years. The value of an attractive smile should not be underestimated. A pleasing appearance is a vital asset to one’s self-confidence. A person's self-esteem often improves as treatment brings teeth, lips and face into proportion. In this way, orthodontic treatment can benefit social and career success, as well as improve one’s general attitude toward life. ・ If you have medical or dental insurance, bring the necessary completed forms. This will save time and allow us to help you process any claims. Broken Appointments: If for some reason you cannot make it to your appointment, please contact our office at 86-010-5785-3689. By doing so you allow another patient to use that time as well as reschedule your appointment. If it is determined that treatment is indicated, you will be scheduled for diagnostic records. These records usually consist of study models, diagnostic photographs and orthodontic x-rays. Once these orthodontic records have been obtained, our orthodontists will review them and determine a specific treatment plan for your orthodontic needs. Then our office will give you a call to review your treatment plan, set up the necessary appointments to begin your orthodontic treatment and set up financial arrangements for you. Periodic visits are an important part of orthodontic treatment. Generally, we will want to see you every 4 to 8 weeks to check your progress and make adjustments to your braces. During this time, you will need to keep appointments, follow instructions, eat nutritiously and practice good oral hygiene. Also continue to visit general dentist if necessary. Braces may be on between 6 months to 30 months or longer depending on the age of the patient, the severity of the problem, the patient's cooperation and the degree of movement possible. Before any orthodontic treatment, general dentist should make certain that all cavities have been treated and the health of your gums and underlying bone are free of periodontal disease. In addition, general dentist or an oral surgeon will remove any teeth that our orthodontists prescribed to correct your bite. General dentist should also schedule cleaning and cavity checkup visits during your orthodontic care. We would like to reinforce the need to keep your regular visits with general dentist. 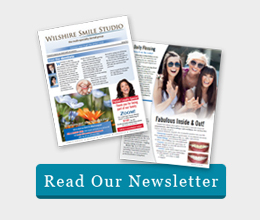 Our orthodontists provide orthodontic treatment for adults, adolescents and children. We follow international guidelines by recommending that an orthodontic evaluation take place at age 7 for all children. This early evaluation can help to determine the best time to begin any necessary treatment. Many growth modification treatments are now available for patients 7 to 11 years of age, that provide significant benefits, especially when jaw irregularities are present. These treatments may also prevent certain conditions from worsening. Treating children with these types of problems during their growth stages allows our treatment to achieve results that may not be possible when face and jaw bones have fully developed. This early treatment can simplify or eliminate additional treatment for the child. Traditional metal braces are used to be the most popular with kids and teenagers. They love using different colors of ligature ties. These braces are much smaller than ever before. In the "old days", metal braces were not just brackets, but bands that wrapped around the entire tooth. Today, metal brackets can be boned to the surface of each tooth, which is a big improvement in orthodontic field! The bands are now only reserved for back teeth (molars) or teeth with large fillings. The metal brackets are very strong and can withstand most types of treatment. They require an o-shaped band, or metal tie wire (thin wire which is twisted around the bracket) to hold the arch wire onto the bracket. However, the traditional metal braces are not very comfortable and require more frequent visits for regular adjustment comparing with modern self-ligating metal braces. There are several types of self-ligating brackets according to their different design of “self ligature” part, which can be a built-in “sliding door” or “special clip”. Damon-Q braces from American Ormco company is a typical reprehensive of “sliding door” design; Bio-Quick braces from German Forestadent company is a reprehensive of “special clip” design. Translucent clear ceramic braces are the most popular with adults. You have to be very close to someone to be able to see them. Yet, because they are a ceramic material, they are more fragile. Quite often, we will put ceramic braces on the top teeth and metal braces on the bottom. Ceramic brackets are made of tooth-colored material and generally do not stain. Adults prefer ceramic braces because they "blend in" with the teeth and are less noticeable than metal braces. The ligatures (little o-shaped rubber bands) that hold the arch wire onto the ceramic brackets can also be clear, which really looks great at first, but the ligatures can stain, especially when you eat a lot of curry, drink a lot of black coffee, or smoke. While, it's only the ligatures that stain, not the brackets themselves, and the ligatures are changed each time you get an adjustment -- usually, monthly, therefore the stained ligatures won’t be a big issue. Cosmetic self-ligating brackets are now also available. It improves the appearance of people who wear the brackets, and also has all the advantages that self-ligating brackets should have. If you are interested in them, please ask our orthodontists. Among all of the aesthetic or cosmetic braces or techniques, including lingual braces and Invisalign, ceramic braces have the largest range of indication, actually they can be used in any cases for which conventional metal braces are suitable; meanwhile the patients will not have to suffer any extra discomfort compared with the conventional metal braces. Lingual braces are mounted behind a patient's teeth. Generally, lingual braces are more uncomfortable than standard braces. In addition, some people have trouble talking with lingual braces. Presently, lingual braces are only used in special clinical cases. Orthodontic headgear is a very important part of the treatment for some patients. Headgear creates forces that guide the growth of the face and jaws. It also is used to move teeth i, nto better positions or to prevent teeth from moving. ・ Always be careful when removing your headgear. If the headgear is removed carelessly, the part that fits in your mouth and attaches to your teeth could injure your lips, cheeks, face and possibly your eyes. ・ Never remove the headgear until the straps have been disconnected. ・ Never lift the headgear over your face. ・ Never wear the headgear when running or playing sports. Take your headgear with you to every appointment. If it becomes soiled, our orthodontists will tell you how it should be cleaned. Let our orthodontists know if you continue to be uncomfortable for more than a few days. Wearing headgear is necessary for your treatment. Follow the instructions exactly, and you will complete your treatment without any changes in your treatment plan. Functional appliances, including functional removable and fixed appliances, unlike conventional braces, are used to influence growth of the jaws in order to effect changes in facial structure. In addition, they are often used before and in conjunction with fixed appliances. Functional removable appliances are not utilized to treat all orthodontic problems. It takes skill, and experience to recognize conditions that will respond favorably to functional removable appliances. Timing of such therapy also is very important. Although functional removable appliances can easily be taken out by the patient, there may be a tendency not to wear them as we have prescribed. This means your teeth, jaws and muscles may move back toward their original positions. Our orthodontists will determine how long you need to wear your retainer. Time varies with each patient. Some people may need retainers for an extended period of time in order to eliminate shifting of the teeth. In some cases, permanent retention may be necessary. After braces are placed in the mouth it is normal for the teeth to be sore for about 2 or 3 days. Tylenol or Ibuprofen (unless allergic or contraindicated) will help relieve this discomfort. Some irritation to the cheeks and tongue is normal, but if you feel anything sharp is poking you or any sores are developing, please call our office at 86-010-57853689. If you forget to insert your elastics one day, don't double up the next day ― just follow your regular instructions. If your elastics break frequently, a wire or band loosens, or a hook breaks off ― call our office immediately. Don't wait until your next appointment. These problems need to be corrected as soon as possible! The removable retainers and appliance is carefully designed to hold or move your teeth. , It is important that it is worn according to instructions and brought to each appointment. Wear your retainers or appliance at all times, even while you are asleep. It may be removed while eating, swimming, or playing vigorous sports activities. In two or three days your speech will return to normal with the appliance in place. Avoid flipping your appliance with your tongue. This can cause damage to your teeth or breakage of your retainers or appliance. New appliance may make your teeth sore for a day or two, especially after an adjustment. If you have a sore spot on your gums call our office so that we can adjust the appliance. Clean your retainers or appliance by brushing it daily without toothpaste. Denture cleaner can be used for a more thorough cleaning. If you are wearing a bonded wire retainer behind your front teeth, be extra careful to clean the wire and the area around it. Flossing should be done every day. Never wrap your appliance in a paper napkin or tissue and set it down on the table. You or someone else may throw it away. Don't put it in your pocket when playing or you may break or lose it. Whenever it is not in your mouth it should be in its plastic appliance case. Keep your appliance away from dogs or cats as they love to chew on them. Avoid storing them near any source of heat. Do not boil your retainer to sterilize it! If a wire causes irritation, push the wire away from the area using the eraser end of a pencil or a Q-Tip. If the wire cannot be tucked away, cover the end of the wire with a small piece of wax, a cotton ball, or a piece of sugarless gum until you can see our orthodontists for an adjustment. Take Aspirin, Tylenol or Ibuprofen (unless allergic or contraindicated) if your teeth are sore after a monthly visit. If you cut your gums, tongue or the inside of your cheek, apply finger pressure to the bleeding site for several minutes. If the bleeding does not clot, call your orthodontist or general dentist.